This October we will have having two events where we will be having drinking contests as well as weekly raffles where you can win a BCA Stein Tank. The Raffles will be drawn every Saturday in October at 8pm SLT (with an announcement around 8:30 SLT) To be entered you will need a weekly drink total of 15L. We will pull 5 names and the winners do not need to be online at the time of the drawing and will have until the end of the month, Oct 31st, to claim their prize. The drinking contests will be held with events we will be hosting at the beginning and end of the month. We have 25 of these frosty tankards up for grabs! This weekend September 26th, 27th, and 28th we will be having drinking contests to win a limited edition Frosted Stein, after all of that is said and done any left over steins will be put up for sale to buy with milk. Final drinking contest to be at 11 am SLT Monday. Different tiers of prizes are unlocked with different amounts drank, the top drinkers will win prizes for the tier that has been achieved. The tiers and the prize places are listed below. Under 25 Liters total consumed top three all get an applier pack. Good Luck and happy Drinking! As part of our birthday celebration we have a Birthday Stein Tank 5L available to be won from either a drinking contest or a raffle. This will not be for sale. Its a 5L tank like the milk bottles, it is refillable and reusable. 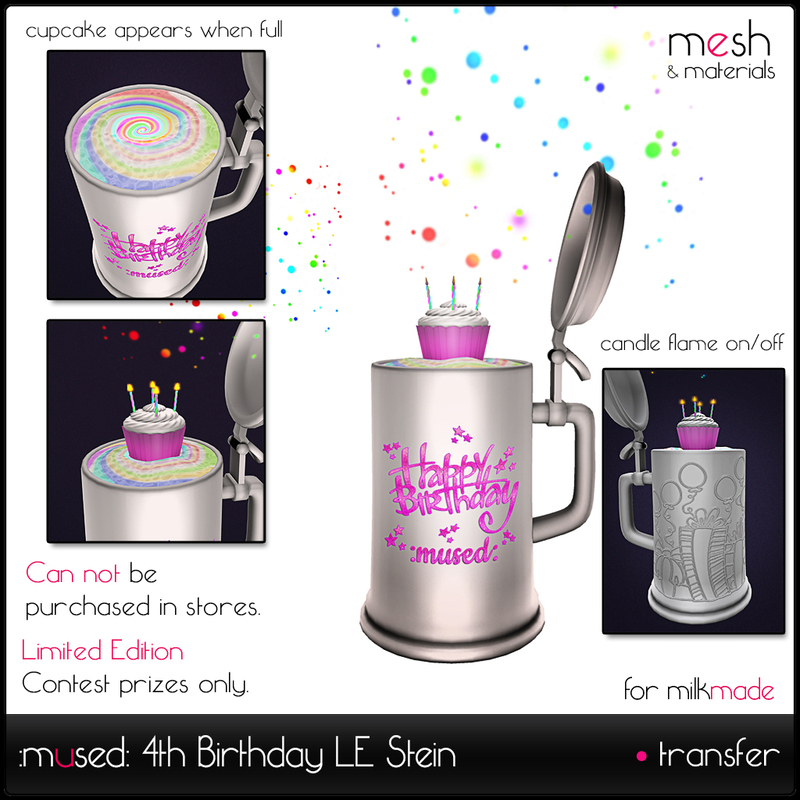 You can set your own texture on the front, resize it, the lid opens and closes, and it has two different animations, one for holding and one for drinking! 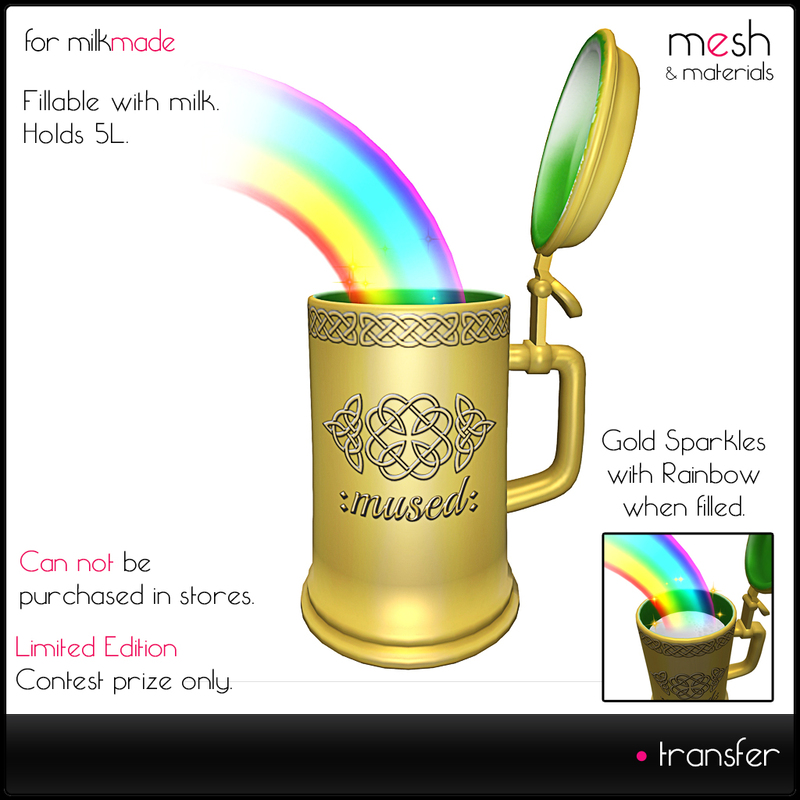 The Drinking Contests will be run during the :mused: birthday party: Sunday May 18th at 2pm and 4pm. Under 25 Liters total consumed top three all get a :mused: Lover Shirt.